August 28, 2017 - Gov. Nathan Deal, joined by First Lady Sandra Deal, members of the King family, Atlanta Mayor Kasim Reed, Lt. Gov. 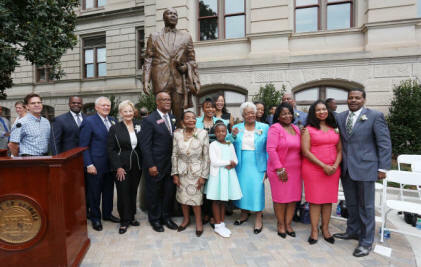 Casey Cagle, House Speaker David Ralston, Rep. Calvin Smyre, members of the Georgia Capitol Arts Standards Commission (CASC) and other dignitaries, unveiled the Dr. Martin Luther King Jr. statue at the northeast quadrant of the State Capitol. The eight-foot-tall bronze statue was created with locally sourced materials by Atlanta-based sculptor Martin Dawe of Cherrylion Studios and stands atop a 36-inch pedestal made of Georgia granite. “We are gathered here today to celebrate the completion of a years-long effort to commemorate the life and works of Georgia’s own son, Dr. Martin Luther King Jr.,” said Deal. “Dr. King’s legacy is one of hope. He gave, and continues to give, men and women a reason to believe and to dream. He expanded the aspirations of future generations. The America we know is a better place because one man followed his conscience. Erecting a monument in his memory, both facing Liberty Plaza and on the grounds of the Capitol of his home state, is a fitting and long overdue honor. Today is an historic occasion, one made possible through the vision, cooperation and collaboration of many. In March 2015, Deal signed an executive order authorizing Smyre, a CASC board member, to act as a liaison between the state, members of the King family, the Martin Luther King Jr. Advisory Council and CASC throughout the project. Deal and the commission’s selection committee announced that Dawe had been selected to create the statue in June 2016. The Dr. King statue stands in the original location of Georgia’s Liberty Bell replica, which rang on Capitol grounds for special and patriotic occasions from 1950 until 1976 and is now located in Liberty Plaza. The American Red Cross is there to help families affected by disasters by providing shelter, warm meals and hope in their darkest hour. We need the entire Red Cross community to come together, to help us continue to meet the urgent needs of thousands of families. Every 8 minutes, every day, the American Red Cross responds to a disaster big or small and makes this promise. This year, you can help them keep that promise. The The likelihood that you and your family will recover from an emergency tomorrow oft depends on the planning and preparation do today. While each person’s abilities and nee are unique, every individual can take steps prepare for all kinds of emergencies from fire and floods to potential terrorist attacks. evaluating your own personal needs and make an emergency plan that fits those needs, you and your loved ones can be better prepared. This guide outlines common sense measures older Americans can take to start preparing emergencies before they happen. Preparing makes sense for older Americans. Get Ready Now. .